Steve Irwin was passionate. Steve Irwin was a nut. It could be said that Steve Irwin was a passionate nut! However, what ought to be most striking to the Christian about Steve Irwin was that he (most probably) didn't have his trust in Jesus. Knowing this we ought to be even more saddened over his death and everyone else who dies without knowing Jesus. On this week's episode of On the Poddy we talk about him and some reflections from the Bible. 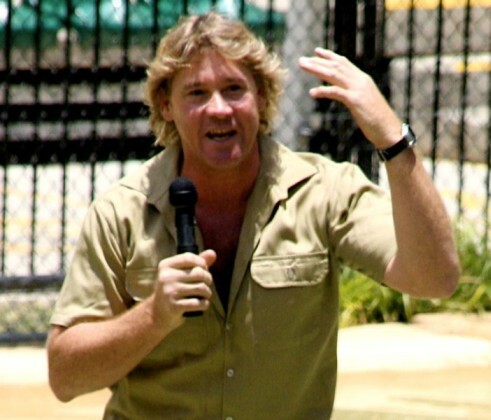 Listening to Steve Irwin sound clips last night on the radio, I was reminded of his exuberance, enthusiasm and energy for that which he was passionate. It's reported that his passion was genuine and that what you saw on camera was what you got. There are many things that people are passionate about: animal rights, human rights, politcal views, favourite sporting team, holden or ford, pc or mac, food, other people, etc... Even Christians are passionate about a whole variety of things. What I struggle with is the lack of passion that I observe Christians have for Jesus and the gospel of His death and resurrection. I'm not pointing the finger at other people any more than I am pointing the finger at myself. Why do you think we are often not as passionate about Jesus than we are about other stuff? How ought we express our passion? A hearty Amen David! Why do I get "excited" about so many meaningless things, and not about something as meaningful as the Gospel. My first thought was that maybe it was to do with guilt. Maybe we aren't passionate Jesus because it makes those who hear us feel guilty but ... both the passionate conservationist and the passionate Christian both have the same effect on their hearers - guilt! The passionate Christian will make people feel guilty for rebelling against God, and the passionate conservationist will make people feel guilty about how they treat creation. thanks for the comments daniel. i don't know how much it is guilt... but i think maybe it could be more failing to be gripped by the gospel. "However, what ought to be most striking to the Christian about Steve Irwin was that he (most probably) didn't have his trust in Jesus"
joel... i didn't know that. but do you want to answer the question i raised?? Good post David. I completely agree. It is terribly sad that Steve probably didn't know God - I pray that his wife and family will find their comfort in God - and come to know him themselves. Back to the basic question: Why do we get so passionate about meaningless things instead of Jesus and how He saved us? I suppose it's because the "meaningless things" are more real to us than Jesus. Why is that? Because we don't know Jesus as we should. Why? Because we don't spend real time and devotion with Him. Do we really seek Him with all of our heart, soul and mind? I have to admit...that I really don't all the time. As far as "crikey" goes-I didn't have any idea that it was a derogatory term for Christ. I'm an American. We don't say "crikey" over here. I just thought it was an amusing Ausie slang. I guess I'll know now. I'm not sure if this is true or not, but I heard from somehere that steve irwin gave his heart to the Lord 2 or 3 weeks before he died. Has anyone heard about that? it would be great if it were true, but it doesn't seem to be. the emails that were sent around at the time look to be hoax emails.